For years now I have had a fear of flying which has gotten much worse over the last year in particular. Although I would never let fear get in the way of visiting a destination (I did four 24hour flights between Scotland and Australia within 18 months) where the opportunity prevails to travel by alternative means without paying a fortune, I will always take it! In order to get from Europe to Asia overland the best way to do it seems to be via the Trans-Siberian Railway. A really good resource I found is this website by “The Man In Seat 61” for anyone else thinking about doing something similar. It’s not a commercial website i.e. you can’t buy tickets from it etc, but it answered a lot of questions for me personally. The whole idea of travelling by train right now just seems so much more appealing to me for a number of reasons, even taking my fear of flying out of the equation, you will get to see so much more of the world. The fact I will be able to make so many interesting stop offs through Eastern and Western Europe, Russia, Mongolia, China, and South East Asia, has really given me a boost after a miserable winter here in Scotland, and whetted my appetite. I’m planning on doing what I call “the big save” before I go which means I won’t be able to leave until September, although I will still be making several trips up to the North of Scotland, Hebrides Islands, and a few trips elsewhere in the mean time. I’m considering something very similar for the Fall. 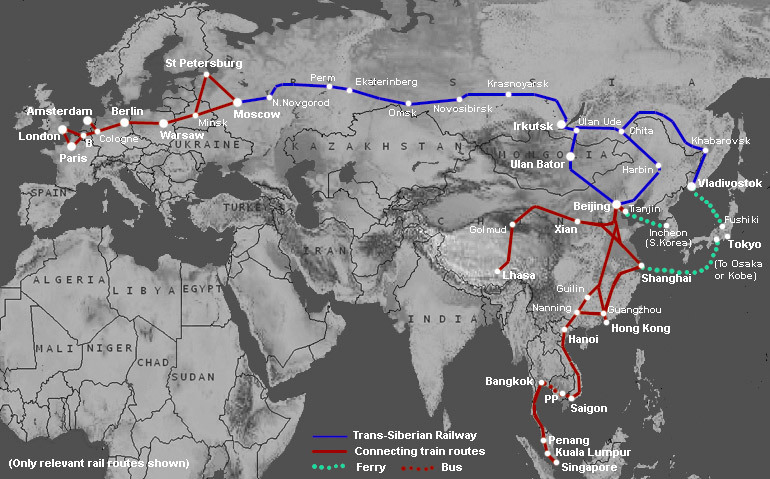 After making my way around Europe, I’ve been considering the Silk Road train from Moscow to Beijing and then making my way down south from there. Man in Seat 61 is great, I’ve read through that quite a bit as well! Thanks. The Silk Road train looks great! I think I am probably going to opt for the Trans-Siberian or possibly the Trans-Mongolian route, although a trip through Kazakhstan sounds awesome. I’ve just discovered his site thanks to you Jane 🙂 Still reading through it but it sounds amazing. Though John did look at me skeptically since I can’t stand being in a car for more than an hour…. L* Getting to Moscow is a whole other adventure I need to plan for. What sites have you found useful for traveling Europe? The Seat 61 website was one of the first things I looked at because the Trans-Siberian/Trans-Mongolian is definitely a must-do on my RTW. Great to hear from otherings doing the same! I’ll be leaving around the same time as you to start my RTW but probably will not be on the Trans-Siberian/Trans-Mongolian until May of 2011. I have been planning quite similar to this but in the reverse so I’m not sure we will be able to to meet up there but maybe somewhere else along the way. Feel free to contact me! I hope to hear more from you and please do share if you discover people who have done the trip before or has any useful info. I really want to know what the best way to get a “invitation” to Russia is. Will do. I am actually olny leaving Edinburgh in September. I don’t yet have a set timeframe as to how long I will be in Europe before heading to Moscow so i’ll keep you updated, and will let you know if I come across anyone else who has done it. The Trans-Siberian Railway is a traveller dream! Russia, Mongolia, China… And by train! It’s wonderful! Yea I can’t wait to get started! Travel by train just seems so much more inspiring than by plane these days. Wasn’t the favorite part of my trip, but have heard so many people that loved it more than me, that you should certainly do it. You can book your own tickets in Moscow — you don’t need to pay some travel agent double ticket prices to do it for you. Process is easy. Just have your local hostel person write out the ticket you want in Russian. I love seat61.com, but don’t use the travel agents he recommends. The big suggestion I have for you is that two trains a week (I think) are what those agencies book tourists on. It is sort of the “tourist Trans-Siberian.” I’d book on one of those two. There will be a lot more people on board and more fun for you. In actuality, there is a train leaving every day — I just booked on the one that left the next day — and my train was literally empty for 4 whole days. BORING. hey, roughly how much would going from moscow to singapore cost? (very roughly of course) and how long would it take? This is awesome i really want to plan for it when im done university…but im assuming it would be in the ball park of $20,000 USD? If you book your train ticket direct from the train station in Moscow, I know you can get from Moscow to Beijing for 400 GBP (which is a huge saving on booking it from UK or USA, where it would usually cost well over 1200 GBP to book via a tour operator). This also includes your accommodation on the train too, as it takes around 1 – 2 weeks to make it without stopping. I think if you pay a little bit extra you can also include food on board too. However, you will probably want to make some stop offs along the way, so I’d more than double that figure to around 1000GBP just to incorporate any accommodation & living costs where ever you stop off. Also, visa’s are something you will have to incorporate into your travel budget. Beijing to Singapore is a lot harder to judge, as it will depend greatly on what mode of transport you choose, where you stay, how long you stay in each destination etc etc. I think overall however, $20,000 for the entire trip is a good budget. Obviously by staying in cheap backpacker hostels, travelling by overnight bus, and eating in at the hostel will save you money.